BEEBE, Ark.  Workers for an environmental services company on Sunday finished picking up the carcasses of about 2,000 red-winged blackbirds that fell dead from the sky onto a central Arkansas town's streets, sidewalks and lawns. Beebe Mayor Mike Robertson told The Associated Press the last dead bird was removed about 11 a.m. Sunday in the town of about 5,000 residents located about 40 miles northeast of Little Rock. He said 12 to 15 workers for U.S. Environmental Services, hired by the city to do the cleanup, wore environmental-protection suits for the task. They started the cleanup Saturday. The birds fell out of the sky about 11 p.m. Friday. Robertson said the suits protecting the workers from environmental hazards were only a precaution, worn as a matter of company routine rather than out of any fear that the birds might be contaminated. Speculation on the cause is focusing not on disease or poisoning but on some weather-related event or on New Year's Eve fireworks that might have alarmed and then shocked the birds, he said. Several hundred thousand red-winged blackbirds have used a wooded area in the town as a roost for the past several years, Robertson said. He and other officials went to the roost area over the weekend and found no dead birds on the ground. "That pretty much rules out an illness" or poisoning, Robertson said. Carcasses of dead birds would have been strewn about the roost area if either had been involved, he said. Robby King, a wildlife officer for the state Game and Fish Commission, collected about 65 dead birds on Saturday. They will be sent for testing to the state Livestock and Poultry Commission lab and the National Wildlife Health Center lab in Madison, Wis. The mayor said he did not know where U.S. Environmental Services would dispose of the carcasses its workers picked up. Keith Stephens, a spokesman for the state Game and Fish Commission, said the dead birds fell in an area about a mile long and a half-mile wide. He said all but a tiny fraction were red-winged blackbirds, a species that favors the Delta area of east Arkansas where rice and soybeans are widely grown. 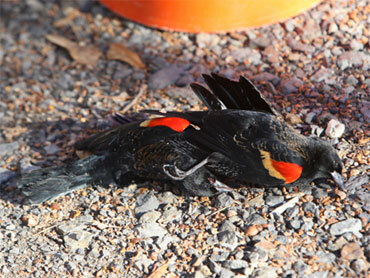 It's not the first time dead birds have rained from the sky in Arkansas, Stephens said. "We had an incident in Hot Springs where a couple of dozen birds fell out of the sky after being hit by lightning," he said. During a thunderstorm, a bolt of lightning startled residents of one neighborhood "and within a few seconds, ducks started raining out of the sky," Stephens said. And in Stuttgart during the 1940s or 1950s, he said, dozens of birds were killed in flight when they got caught up in a hail storm.